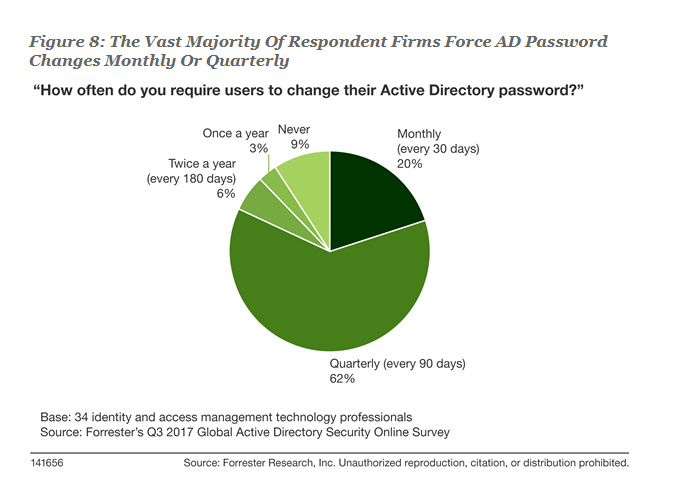 Forrester just released The State of Microsoft Active Directory 2018 report by Merritt Maxim, and it’s definitely something that anyone interested in current state of Active Directory (AD) usage and where it’s going should read. Demand for Cloud Based AD is growing. On-prem AD is still dominant in the enterprise, but as cloud deployments of applications and services grow, AD in the cloud is growing with them. If you are concerned with the security of your on-prem AD environment, you will need to account for its alignment with how cloud AD is rolling out. Keep AD Simple, Security. AD has been in place in many organizations for more than a decade and has grown and changed organically. This leads to complexity that is the enemy of good security – with vulnerability hiding in complex forests, structures and configurations. AD is not just for Employees. AD is increasingly being used to hold and identify contractors, partners, and assets such printers and devices. These items in AD need special treatment and the security team needs to be aware of what’s there, why it’s there, and how these items should be permissioned and managed. The report goes on to detail these findings with nine top trends that Forrester predicts will be shaping AD deployments in 2018. You’ll probably recognize your companies in these! At STEALTHbits we’ve seen these trends in our customers and have helped them deal with the security implications. We help customers understand what’s in their AD, where the complexity contributes to vulnerability, and how it should be simplified and configured to align with organizational needs. AD is secure when it’s clean, understood, configured properly, monitored closely, and controlled tightly – something we can help with. To attend our upcoming webinar, 5 Steps to Active Directory Clean Up, click here. Fred Pinkett is VP of Product Strategy at STEALTHbits Technologies responsible for product vision and innovation. With a 20+ year tenure in security and storage, Fred brings extensive Product experience to STEALTHbits. Prior to joining, Fred was Sr. Dir of Product Management at Nasuni, VP of Product Management for Security Innovation, and VP of Product Management at Core Security. He has also held senior product management positions at Pedestal Software, Network Associates, and RSA Security. Mr. Pinkett holds an MBA from Boston College and a Bachelor of Science in Computer Science and Engineering from Massachusetts Institute of Technology.